Chapter 1. Concepts, definitions, conventions, and notation. Chapter 3. Experiments and their evaluation. Chapter 4. Tools for reduction of complexity. Chapter 5. Elementary combinations of reaction steps. Chapter 6. Practical mathematics of multistep reactions. Chapter 13. Unusual thermal and mass-transfer effects. Chapter 14. Instability, periodic reactions, and chaos. This book addresses primarily the engineer in industrial process development, the research chemist in academia and industry, and the graduate student intending to become a reaction engineer. In industry, competitive pressures put a premium on scale-up by large factors to cut development time. To be safe, such development should be based on "fundamental" kinetics that reflect the elementary steps of which the reaction consists. The book forges fundamental kinetics into a practical tool by presenting new, effective methods for elucidation of mechanisms and reduction of complexity without unacceptable sacrifice in accuracy: fewer equations (lesser computational load), fewer coefficients (fewer experiment to determine them). For network elucidation, new rules relating network configurations to observable kinetic behaviour allow incorrect networks to be ruled out by whole classes instead of one by one. For modelling, general equations and algorithms are given from which equations for specific networks can be recovered by simple substitutions. The procedures are illustrated with examples of industrial reactions including, among others, paraffin oxidation, ethoxylation, hydroformylation, hydrocyanation, shape-selective catalysis, ethane pyrolysis, styrene polymerization, and ethene oligomerization. Many of the rate equations have not been published before. 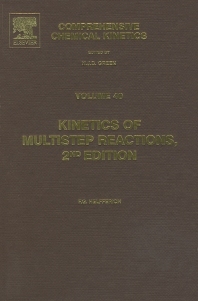 The expanded edition of the 2001 title, Kinetics of Homogeneous Multistep Reactions includes new chapters on heterogeneous catalysis and periodic and chaotic re-actions; new sections on adsorption, statistical methods, and lumping; and other new detail. For the engineer in industrial process development, the research chemist in academia and industry, and the graduate student intending to become a reaction engineer.